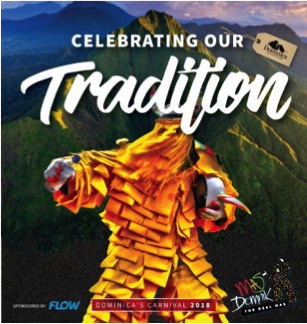 Roseau, Dominica – (January 9, 2018) – The Official Media Launch of Dominica’s Carnival – Mas Domnik 2018, which took place last Friday, placed the minds of Dominican patrons and visitors alike, to comfort, as details of what is expected to be one of the most traditionally spontaneous Carnivals were made available to the public. Post Hurricane Maria, many Dominicans have set out to rebuild and reaffirm relationships with a determination that demonstrates Dominica’s event and cultural tourism product is alive and well. While the devastation suffered has caused us to make adjustments to the scale of the celebration, the need to continually embrace our cultural heritage is ever present. This enabled a captivating and exciting tagline for the 2018 edition – ‘Celebrating Our Traditions’! Attendees at the Launch included Senator Robert Tonge, Minister for Tourism and Urban Renewal who presented the Feature Address, further expanding on the way forward for Dominica’s Carnival. Senator Tonge stressed the importance of Carnival by describing it as one of the most creative and imaginative aspects of the Dominican life. Senator Robert Tonge reminded the public of the economic benefits of hosting such a national event, “Mas Domnik provides a unique opportunity for our creative community – costume builders, song writers, music producers, seamstresses, tailors and performers of varying kinds to rise to the occasion and present their craft in a unique and distinct manner”. The launch of Mas Domnik 2018 came alive with other invited guests which included Mr. Raymond Lawrence – Chief Cultural Officer of the Cultural Division and Mr. Kareem Guiste – Regional Marketing Manager – Business and Government, FLOW, both of whom expressed assertiveness, commitment and just cause in working assiduously to ensure materialization of this national product. The 2018 Carnival Calendar, though scaled down tremendously, still boasts six weeks of calypso shows, celebrations, parades and fetes for every age group. Mas Domnik, The Real Mas, is considered the last remaining fortress of true authentic masquerade in the Caribbean, and will run right through Carnival Monday and Tuesday on February 12th and 13th, culminating on Wednesday February 14th 2018 with the Taway Vaval in the Kalinago Territory, home to the largest indigenous population of Caribbean peoples in the region. Previous PostBARBADOS’ 2018 Annual Event LineupNext PostNoreen Young’s “Under the Umbrella Tree” now on YouTube! Thanks for your fantastic blog. It was very useful. I am just so happy I discovered this. Thanks for a really fantastic blog. It was very useful. I am so glad I came across this. Great website, how do u get all this information?I’ve read through a few articles on your website and I like your style. Thanks a million, keep up the good work.